Catch the country’s preeminent ballet and contemporary dance company this August in “A Gala Celebration”. Ballet Philippines revives choreographic gems in a gala featuring Filipino stars from various international dance companies. Among the guest artists are Candice Adea (formerly of BalletMet and Hong Kong Ballet), Marcelino Libao (Hamburg Ballet), Kris-Belle Paclibar (formerly of Cirque du Soleil), Ronelson Yadao (formerly of Cloud Gate Dance Theatre), Paul Ocampo & Chien-Ying Wang (OcampoWang Dance), and Jean Marc Cordero & Rita Angela Winder (Ballett Kiel). This production marks the return of Alice Reyes, National Artist for Dance, as the company’s Artistic Director. Handpicked to showcase the excellence at the company’s core, the featured works include Agnes Locsin’s “Salome”, Bam Damian’s “Minamahal, Sinasamba”, Edna Vida’s “Vision of Fire”, Norman Walker’s “Summer’s End”, and an excerpt from the classical ballet “Raymonda”. 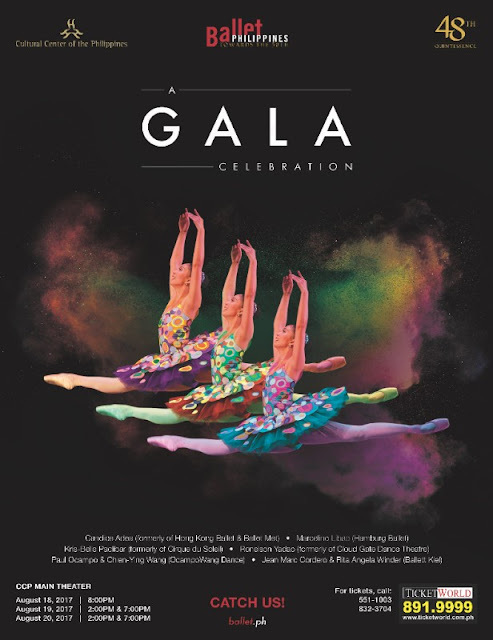 “A Gala Celebration” runs at the CCP Main Theater from August 18 to 20. This is the first production of the 48th Season, entitled “Quintessence”. The season’s lineup also includes “The Exemplars: The Best of Ballet Philippines (1970-1980) on October 20-22, Edna Vida’s “The Nutcracker” on December 1-10, and “Don Quixote” on February 9-18, 2018. Catch us! For tickets, call Ballet Philippines at (+632) 551-1003, the CCP Box Office at (+632) 832-3704, or Ticketworld at (+632) 891-9999.